Caleb Swanigan (born April 18, 1997) is an American professional basketball player for the Sacramento Kings of the National Basketball Association (NBA). He played college basketball for the Purdue Boilermakers. He was ranked among the top prep players in the national class of 2015 by Rivals.com, Scout.com and ESPN. He completed his senior season in the 2014–15 academic year for Homestead High School, who went on to win the first state championship in the school's history. Swanigan was named Indiana's Mr. Basketball and a McDonald's All-American. Swanigan originally committed to Michigan State University, but later decommitted and committed to Purdue University. He was named Big Ten Freshman of the Week three times, a record at Purdue. He was also named to the Big Ten All-Freshman Team and also received a National Freshman of the Week award. Swanigan finished the season with 10.2 points per game and 8.3 rebounds per game. During his sophomore year, Swanigan was named the Big Ten Player of the Year and first-team All-Big Ten, and was a unanimous first-team All-American. He was a finalist for the 2017 Karl Malone Award, given to the nation's top power forward. On June 22, 2017, he was selected 26th overall in the first round of the 2017 NBA draft by the Portland Trail Blazers. Caleb Swanigan, born April 18, 1997, grew up in an unstable home due to his father, Carl Swanigan Sr., who had a crack cocaine addiction. Swanigan's mother, Tanya, had six children. Swanigan moved between Utah and Indianapolis, Indiana during his youth, spending time in homeless shelters. Swanigan inherited two key features from his biological father—height and a tendency to obesity. The elder Swanigan, who died in 2014 from complications from diabetes, was 6 ft 8 in (2.03 m) and weighed nearly 500 pounds (230 kg) at his death. By the time Swanigan was entering eighth grade, he was 6 ft 2 in (1.88 m) and 360 pounds (160 kg). Swanigan has described his bad eating habits as primarily eating desserts and being surrounded by unhealthy food due to his family's financial situation. Swanigan's large size was the reason his aunt nicknamed him "Biggie," often saying "Biggie Biggie Biggie, can't you see." His weight issues, according to ESPN writer Myron Medcalf, were also a symptom of his unstable home situation. His father had many brushes with the law, battled drug addiction for most of his adult life, and physically assaulted his wife. According to a story in Bleacher Report, he was accidentally dropped by his mother as an infant, leaving a bruise on his face; this incident led her to move with her children to Salt Lake City. For the next decade, the family bounced between Indianapolis and Utah; he recalled that he lived in five different homeless shelters and attended 13 different schools by the time he was 13. When his mother decided to move the family to Houston, his older brother Carl Jr., concerned that Caleb would keep gaining weight if he moved with his mother, called his former AAU basketball coach, Roosevelt Barnes, a former three-sport star at Purdue who played on the school's 1980 Final Four team and now a successful sports agent. Barnes, living in Fort Wayne, Indiana, agreed to take Caleb in if he could adopt him and raise him as his own son. Barnes adopted Swanigan prior to his 8th grade year. Barnes addressed Swanigan's eating habits and, after receiving clearance from a cardiologist, began putting him through workouts similar to those Barnes himself went through in college. By the time Swanigan finished high school, he had slimmed down to 260 pounds (120 kg). In the fall of 2011, Swanigan attended a basketball camp led by NBA former coach John Lucas after Barnes convinced Lucas to let him into the invite-only camp in Louisville. When it came to selecting his high school, Swanigan's guardian Barnes said, "When he chose his high school, his high school had never really done much in the tournament, and his goal was to win a state championship at a school where that had never been done before." Swanigan attended Homestead High School and wore the same number as Barnes, number 44. As a senior, he was named Indiana Mr. Basketball and led Homestead to a first-ever state title. He was ranked as a top-20 national prospect in his class. He was named a McDonald's All-American. Swanigan averaged 22.6 points and 13.7 rebounds as a senior. Academically, Swanigan maintained a 3.1 GPA and graduated in three years instead of the usual four. Swanigan had several teams recruit him and offer scholarships; Arizona, Kentucky, Cal, and Duke were among the schools that gave Swanigan an offer. Caleb Swanigan verbally committed to Michigan State on April 10, 2015, but decommitted on May 7. He said, "I just felt like it was better basketball-wise for me." Similar to his high school decision, Barnes said, "He wants to win a national championship and said he wants to do it in the state of Indiana and wanted to do it at a place he's never done it before." Some people believe Barnes had ulterior motives in adopting Swanigan, to which Barnes said, "Maybe if I wanted to develop the next hot-dog-eating champion, the next Joey Chestnut, people would have a legitimate gripe." Swanigan had not consulted Barnes before he committed to Michigan State, and some believe that since Barnes played sports at Purdue he was a major influence in Swanigan decommitting from Michigan State. Barnes said that was not the reason Swanigan switched, and the primary reason for Swanigan choosing Purdue was the presence of two centers that were taller than 7', Isaac Haas and A.J. Hammons, which allowed Swanigan to play the 4 spot. He decided to stay in-state and chose Purdue on May 19. Swanigan announced his decision by tweeting "#BoilerUp". Swanigan was Purdue's first Indiana's Mr. Basketball recruit since Glenn Robinson in 1991, and was the first McDonald's All-American for Purdue since 1996. Swanigan joined Ryan Cline and Grant Weatherford in Purdue's 2015 recruiting class. Swanigan chose to major in general education/educational studies. Swanigan chose the number 50 to honor his father who had died at 50 years old. Swanigan started every game his freshman year. His highest scoring game was in a win against Wisconsin in Purdue's last regular season game, where he scored 27 points and missed only one shot from the field. He scored 6 points and grabbed 10 rebounds in #4 Purdue's loss to #13 Arkansas-Little Rock, and did not play at all during the overtime period. After his freshman season, Swanigan was one out of 162 underclassmen to enter their names for the 2016 NBA Draft. However, despite being one of 63 invitees for the NBA Draft Combine that year, he ultimately decided to return to college on May 25, which was also the new date set for players to withdraw their names from the draft and try again for another year. An NBA scout said, "I think he has a chance if he can improve his jump shot and help defense. Big-time rebounder, works hard on his own. He's still more undersized center than power forward, though." Similar to his freshman year, Swanigan started every game as a sophomore. Swanigan set his personal record for points against Norfolk State with 32, with an 83% field goal, 33% three point, and 90% free throw percentage. Swanigan also managed to grab 20 rebounds, making it one of his four games with at least 20 points and 20 rebounds that year. As of March 6, 2017, Swanigan was second in the nation in rebounds per game (12.6) and led the nation in double doubles (25) for the 2016–17 season. He was rated first in CBS National Player of the Year voting. 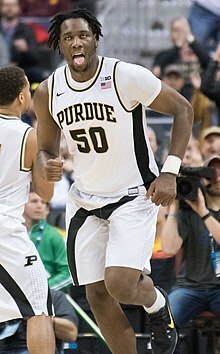 In his sophomore season, Swanigan broke several Purdue records, including rebounds in a season, double-doubles in a season, and an NCAA record with four 20–20 performances. Purdue finished as the regular season Big Ten Champions, but were knocked out in the quarterfinals of the Big Ten Tournament by Michigan, the eventual tournament champions. In the Sweet Sixteen, Purdue paired off against Kansas. Swanigan was 3 for 4 from the three point line, finishing with 18 points and 7 rebounds. Purdue ended their tournament run in a loss to the Jayhawks, 98–66. Purdue entered the tournament as the 4th seed in the Midwest bracket and played Vermont in the first round. Purdue came away with an 80–70 win for their first tournament win in five years, with Swanigan posting a double-double with 16 points and 14 rebounds. Purdue continued its tournament run against Iowa State in the second round. Swanigan nearly got a triple-double with 20 points, 12 rebounds, and 7 assists in Purdue's 80–76 win. At the conclusion of the season, Swanigan announced he would declare for the NBA draft and not hire an agent, therefore maintaining his college eligibility for at least one more year, if necessary. Swanigan was expected to go in the late first or early second round of the NBA draft. Swanigan finished his academic career with a 3.60 GPA during his last semester, and maintained a cumulative GPA of 3.34. On June 22, 2017, Swanigan was drafted in the first round (26th overall) by the Portland Trail Blazers. On July 3, 2017, Swanigan signed with the Portland Trail Blazers. On being drafted, Swanigan said: "Being selected tonight in the NBA Draft is a dream come true. I have been thinking of this moment for a long time. I know this is only the first step in my professional career, but I am extremely excited for to begin this journey". Painter said, "We are thrilled that Biggie has achieved his lifelong dream of being selected in the NBA Draft. It’s been an incredibly tough road for him to get to this point and no one deserves it more than he does". Swanigan was the first Purdue basketball player to be drafted at the sophomore level or lower. During the 2017 NBA Summer League, Swanigan recorded 16.1 points, 10.6 rebounds, 2.25 assists and 1.4 steals per game in all eight games the Trail Blazers played in during the event, including the Summer League Championship game, where they ultimately lost to the Los Angeles Lakers. Despite that, Swanigan would earn All-Summer League First Team honors for leading the Trail Blazers into the Summer League Finals. Swanigan received his first NBA G League assignment, starting December 22, 2017 with the Canton Charge. On February 4, 2018, Portland recalled Swanigan back to the Trailblazers. On December 30, 2018, Swanigan was assigned to the G League, this time with the Texas Legends. On February 7, 2019, Swanigan was traded to the Sacramento Kings in exchange for Skal Labissière. Swanigan qualified for the 2014 U17 World Championship Team by beating out twenty other players vying for a spot to make the 12-man squad. Swanigan played in the U17 World Championship Game. The team finished with a 7–0 record and earned a gold medal in Dubai, United Arab Emirates, extending the USA's total record at the U17 World Championship Game to 23–0. He finished the series with 8.0 points per game and 5.7 rebounds per game, and was the most efficient player on the U17 team, with a 69.6 shooting percentage. Before starting his freshman season at Purdue, on June 18, 2015, Swanigan was announced as a member of the 12-man 2015 USA Basketball Men's U19 World Championship Team for the 2015 FIBA Under-19 World Championship that won a gold medal in Heraklion, Crete. On making the team, Swanigan said, "I always set goals for myself. I set goals for this spring. One of my goals is to make this team to end my high school career." To prepare for the games, Swanigan played in the Nike Hoop Summit, the McDonald's All American Game, and the Jordan Brand Classic. Swanigan did not take part in the Indiana-Kentucky All Star Game so he could attend the U19 training camp. He was one of five players returning from the gold medal-winning U17 squad. Swanigan's teammate Vince Edwards was also in the running to make the team, but was cut at the round of 16. The team finished 7–0, and Swanigan averaged 6.1 points and 4.4 rebounds per game. Swanigan finished his career at Homestead with records for career points (1,649) and rebounds (1,048), as well as the single season points (704) and rebounding records (424). He was also second all time for career blocks (106) and assists (204). Swanigan set several records as a freshman. He was ranked as a top-10 freshman nationally. He set Purdue program records for most rebounds by a freshman (282), games started (34), double-doubles (8), and rebounds per game (8.3). He is also the first major-college player in 25 years that had 600 points, 400 rebounds, and 100 assists in a season. As a sophomore, Swanigan continued to set records at Purdue. He broke the school single season record for rebounds, surpassing Joe Barry Carroll's record that was set in 1979 by recording a rebound against Penn State in their February 21, 2017 matchup. Swanigan broke the single season record for double-doubles at Purdue against #25 Northwestern by recording his 19th double-double. All Big Ten players combined for the last twenty years have two 20–20 games, and Swanigan had four in a single season. Swanigan was named Indiana's Mr. Basketball and also was selected as a McDonald's All-American. He was selected as the Gatorade Player of the Year and the Indiana Basketball Coaches Association Underclass All-State first team. He was the All-USA Today Indiana Player of the year, and was selected to the Associated Press All-State Third Team. In his freshman year, Swanigan earned the Big Ten Freshman of the week 3 times, a school record. He was named to the Big Ten All-Freshman Team. Swanigan was also named the National Freshman of the Week on March 8, 2016. During his sophomore season, Swanigan was selected to the Preseason All-Big Ten Team. Swanigan received the Big Ten Player of the Week award six times, the second most in a season in conference history. Swanigan also was selected unanimously for the Big Ten Player of the Year in the coaches poll, the fourth in Purdue's history, and the AP Big Ten Player of the Year. He was named the Basketball Times National Player of the Year and to five All-America teams: USBWA, Sporting News, USA Today, Sports Illustrated and NBC Sports. Swanigan was named the Lute Olsen National Player of the Week two times. He was also the Naismith Trophy Player of the Week and Academic All-District. Swanigan was a top-four finalist for the Naismith Award, the player of the year award, joining Lonzo Ball, Frank Mason, and Josh Hart. Swanigan was also an Academic All-American for maintaining a 3.3 GPA. Swanigan was a unanimous selection for First Team All Big Ten in both the coaches and media polls. ^ a b Hoffman, Benjamin; Tracy, Marc (June 22, 2017). "N.B.A. Draft: Analysis of Every Pick and Trade in Round 1". Retrieved June 24, 2017 – via NYTimes.com. ^ a b c d e f g Medcalf, Myron (January 24, 2017). "Purdue's Caleb Swanigan has changed his body and his life". ESPN.com. Retrieved January 24, 2017. ^ a b c d King, Jason (October 21, 2015). "Homelessness, Heartache and Hoops: Caleb Swanigan's Rough Road to Purdue". ^ a b c Baird, Nathan (May 19, 2015). "Mr. Basketball Caleb Swanigan commits to Purdue". Lafayette Journal and Courier. Retrieved April 8, 2017. ^ a b c Neddenriep, Kyle (May 20, 2015). "Caleb Swanigan wants to bring a title to Purdue". Indianapolis Star. Retrieved June 27, 2015. ^ Borzello, Jeff (January 28, 2015). "East, West rosters unveiled". ESPN. Retrieved June 25, 2015. ^ Johnson, Chris (July 21, 2015). "Breaking down college basketball's top 25 recruits for 2015: Nos. 20–16". Sports Illustrated. Retrieved July 22, 2015. ^ a b c d "Caleb Swanigan". USA Basketball. Retrieved March 19, 2017. ^ "Caleb Swanigan Recruiting". ESPN. Retrieved March 19, 2016. ^ Borzello, Jeff (April 10, 2015). "Caleb Swanigan, No. 8 in ESPN 100, commits to Michigan St". ESPN. Retrieved June 27, 2015. ^ Goodman, Jeff (May 7, 2015). "Sources: Caleb Swanigan decommits from Michigan State Spartans". ESPN. Retrieved June 27, 2015. ^ Borzello, Jeff (May 19, 2015). "Caleb Swanigan commits to Purdue". ESPN. Retrieved June 27, 2015. ^ a b c d e f "Caleb Swanigan". Purdue Sports. Retrieved April 8, 2017. ^ "Caleb Swanigan 2015–16 Game Log". Sports Reference. Retrieved March 20, 2017. ^ Baird, Nathan (March 18, 2016). "Little Rock forced Purdue to go small". Lafayette Journal and Courier. Retrieved March 21, 2017. ^ "Caleb Swanigan 2016–17 Game Log". Sports Reference. Retrieved March 20, 2017. ^ Parrish, Gary (February 21, 2017). "College Basketball Player of the Year rankings: Caleb Swanigan jumps to No. 1". CBS Sports. Retrieved March 20, 2017. ^ "Purdue Men's Basketball Clinches Outright Big Ten Championship". B1G. Archived from the original on March 20, 2017. Retrieved March 19, 2017. ^ Baird, Nathan (March 10, 2017). "Michigan ousts Purdue from Big Ten tournament". Journal Courier Online. Retrieved March 19, 2017. ^ "Purdue Kansas Box Score". ESPN. Retrieved April 5, 2017. ^ "Purdue Vermont Box Score". ESPN. Retrieved April 5, 2017. ^ "Purdue Vermont Game Summary". ESPN. Retrieved April 5, 2017. ^ "Purdue Iowa State Game Summary". ESPN. Retrieved April 5, 2017. ^ Goodman, Jeff (April 5, 2017). "Swanigan testing draft waters again, won't hire agent yet". ESPN. Retrieved April 9, 2017. ^ a b "Swanigan Selected 26th by Portland". Purdue. Retrieved July 5, 2017. ^ "Caleb Swanigan Stats". Sports Reference. Retrieved March 19, 2017. ^ "Trail Blazers Sign Caleb Swanigan". NBA.com. July 3, 2017. Retrieved July 3, 2017. ^ "Trail Blazers' Caleb Swanigan: To remain with G-League team". CBSSports.com. December 27, 2017. Retrieved January 4, 2018. ^ "Trail Blazers Recall Caleb Swanigan From Canton Charge | Portland Trail Blazers". Portland Trail Blazers. Retrieved May 31, 2018. ^ "TRAIL BLAZERS TRANSFER CALEB SWANIGAN TO NBA G LEAGUE'S TEXAS LEGENDS". NBA.com. December 30, 2018. Retrieved December 30, 2018. ^ "Trail Blazers Acquire Skal Labissière". NBA.com. February 7, 2019. Retrieved February 7, 2019. ^ a b "Homestead's Swanigan named to U17 national team". wane.com. July 29, 2014. Retrieved March 21, 2017. ^ Moore, C.J. (August 31, 2014). "Top 2015 Recruit Caleb Swanigan an Old-School Big Ready to Bang with CBB's Best". Bleacher Report. Retrieved March 20, 2017. ^ a b "USA Basketball 2015 Men's U19 World Championship Team Named". USA Basketball. June 18, 2015. Retrieved July 2, 2015. ^ "Swanigan selected to U19 USA Basketball team". Journal Gazette. June 18, 2015. Retrieved March 21, 2017. ^ "Swanigan Selected to Represent Team USA at U19 World Championship". Purdue Sports. June 17, 2015. Retrieved March 21, 2017. ^ a b c "Swanigan Named Naismith Award Finalist". Purdue Sports. Retrieved March 19, 2017. ^ Cespo, Juan (February 21, 2017). "Caleb Swanigan breaks Purdue Single Season Rebounding Record". SB Nation: Hammer and Rails. Retrieved March 21, 2017. ^ Cepso, Juan (February 1, 2017). "Swanigan Sets Purdue Record for Double-Doubles". SB Nation: Hammer and Rails. Retrieved March 21, 2017. ^ "Swanigan's Stats". #Biggie4NPOY. Archived from the original on March 22, 2017. Retrieved March 21, 2017. ^ "Purdue Men's Basketball: Swanigan named CBS Freshman of the Week". The Exponent. March 10, 2016. Retrieved April 8, 2017. ^ a b "2016–17 All Big Ten Honors" (PDF). Retrieved March 19, 2017. Wikimedia Commons has media related to Caleb Swanigan.